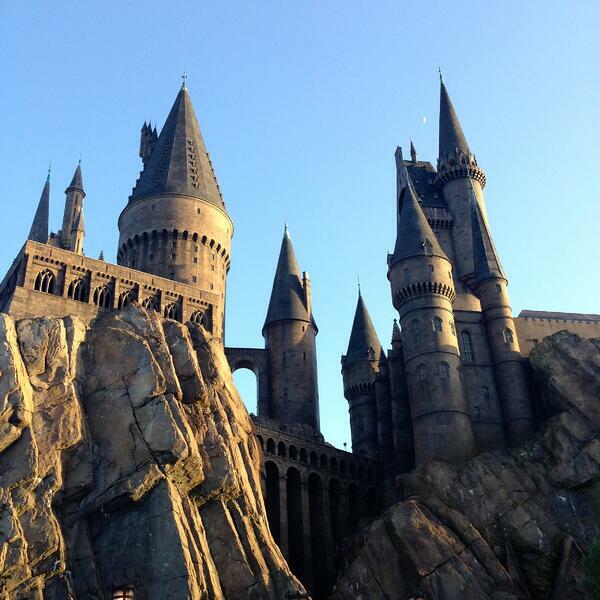 I recently spent a weekend at Universal Orlando learning all about the Harry Potter series. Let me share how I fell in love with this popular franchise, what the celebration is, and how it inspires me to connect with my daughters through story. You'll also find tips and resources to help keep the magic of reading alive after March. If you read the The Father Factor Blog, you know we're readers. We love writing about the importance of connecting books to life to help children fall in love with reading. In fact, one of our most popular post is 6 Tips on How to Show Your Child Reading is Awesome. That post was re-published on LeVar Burton's Reading Rainbow, hello! I've fallen in love with all things Harry Potter. Yes, I'm behind a few years (or a decade). Here's how it happend for me...First Came Hogwarts, then came the movies and books, then came the Harry Potter Celebration at Universal Orlando. First Comes Hogwarts > Before 2014, I couldn't tell you anything about Harry Potter. I mean nothing. In fact, I went to Universal Orlando with my oldest daughter, Bella, for a special Despicable Me 2 weekend and VIP Experience, and never stepped foot on Universal's Wizarding World of Harry Potter. I didn't know enough about the series to realize what I was missing. But last September while at Family Forward 2014, I experienced Hogwarts for the first time. The rides were breath-taking and seeing the storefronts at Diagon Alley took me to a new world. Remember, at this point, I still didn't know the story having not read the books or seen the movies. My introduction to Diagon Alley was Diagon Alley at Orlando. This new world made me interested enough to learn more about the movies. Second Comes the Harry Potter Movies and Books > Once home from the conference, I bought the entire Harry Potter movie series on Apple iTunes. Since last September, my family and I have watched every movie 50-11 times. After watching every movie, I decided to start reading the books to my girls. I drove to the library, got a library card, and with card in hand, the librarian asked me if I needed help. I explained I was at the library for one reason, Harry Potter. She wasn't surprised for some reason. She all but took me by the hand, and walked me to a special section. It wasn't the children's section. It wasn't the fiction section. It was the library's Harry Potter section. No joke, complete with The Mirror of Erised. There I found five copies of Goblet of Fire, four copies of The Half-Blood Prince, and several copies of later books in the series. But, there wasn't one copy of Harry Potter and the Sorcerer's Stone for me. What is "A Celebration of Harry Potter"? The annual Harry Potter™ Celebration is for uber Potter fans. Folks gather from around the world for film talent appearances, unique interactive experiences, demonstrations, and more. 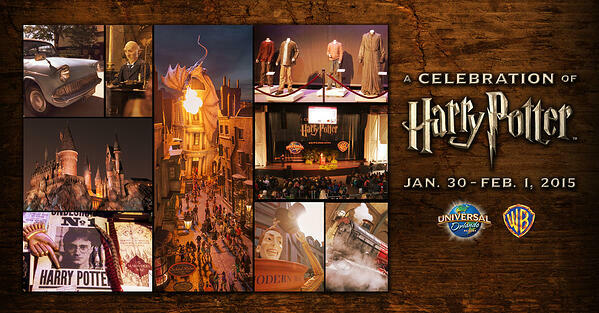 You can experience the Celebration while you walk around The Wizarding World of Harry Potter™. You can walk around and see the iconic Hogwarts Express and enjoy a unique journey by train as you travel between King's Cross Station and Hogsmeade Station at Diagon Alley, you can walk in and out of Honeyduke's candy shop, Olivander's Wand Shop, and so much more. Talk about connecting books to life! The Harry Potter Expo is the place where you get to experience Harry Potter's world for yourself. The expo included booths and exhibits where fans can dive deeper into the magic from the books and films. Warner Bros. Studio Tour London > The production home of the Harry Potter™ film series, Warner Bros. Studio Tour London gave fans the chance to step on to the actual sets used during filming. You could pose for a photo in a recreation of the iconic Great Hall, see Dumbledore's desk (see pic above) or the famous flying car (see pic above) from the series. 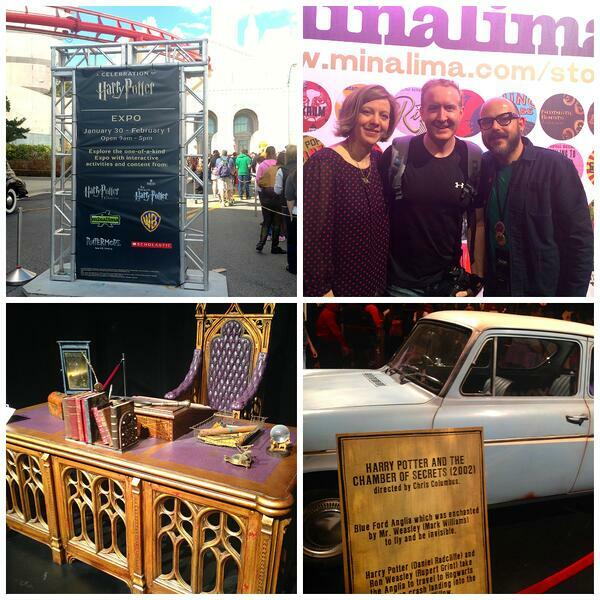 MinaLima (the above pic is me with MinaLima! )> Graphic designers Miraphora Mina and Eduardo Lima created countless pieces of unforgettable artwork, some of which was on display including iconic pieces like the Marauder‟s Map, The Daily Prophet and The Quibbler, and Hogwarts school books, among others. They talked about their recent involvement in The Wizarding World of Harry Potter - Diagon Alley. Pottermore from J.K. Rowling > We were able to show our Hogwarts house colors and celebrate our pride with Pottermore from J.K. Rowling. I'm a Gryffindor, in case you're wondering! Scholastic > We celebrated Harry Potter and shared our message about what Harry Potter means to us on the "Muggle Wall". You could meet award-winning illustrator Kazu Kibuishi, who re-imagined the Harry Potter book covers and was signing posters for Scholastic. I entered to win a box set of all seven Harry Potter books (I keep checking my mailbox!). Kazu Kibuishi was on-site to draw some of the fans favorite Harry Potter characters live on-stage in an interactive panel for all ages. I can't lie here. Being a rookie attendee to the Harry Potter Celebration, I saw this event on the schedule and assumed wrongly it would only be for kids. This ended up being one of my favorite parts of the weekend. Wand deuling is serious business, folks. Kids and adults alike took part in a live-dueling masterclass, hosted by Warner Bros. Studio Tour London, featuring the world's only Wand Combat choreographer, Paul Harris. Who's Paul? Paul choreographed the epic battle scenes in Harry Potter and the Order of the Phoenix and throughout the franchise. He was on hand to teach the technique behind wielding a wand. Swish and flick, y'all. Why are events like this important? For me, whether it's Harry Potter, Dr. Seuss (Universal has an entire land devoted to Dr. Seuss and his books too) and a movie, part of my job as a dad is to help make imagination come to life. It's easier to connect books and movies to life when your child can walk into the wand shop she read about in the book. At a place like Universal Orlando, the books and movies you know come to life. Maybe Harry Potter isn't for you, but if you love reading and want your kids to love books and understand the story behind the films, this is the way to do it. When the story behind the books and movies comes to life, the connection & memories with your kids will last longer than the trip home. How do I keep the magic of reading alive in my daughters? I keep it alive in me. Draw > Read a chapter of a book. Then, have your child draw a scene from the book. What's the last book your child read? What's the last book you read? Did you talk about it? This is not a sponsored post. Neither NFI nor myself was paid for this post. I'm personally inspired by the stories behind entertainment so much that I make time to write about it. Hopefully, reading this inspires you to pick up a book, watch a movie, and/or travel with your family and connect with your child through story.